For more than a year, scientists and conservationists have argued that the 350-meter (1,148-foot) Sukau bridge crossing the Kinabatangan River in the Malaysian state of Sabah would hurt wildlife populations and a blossoming ecotourism market more than it would boost local economies. The paved road that would accompany the bridge would cut through the Lower Kinabatangan Wildlife Sanctuary, home to Borneo elephants and 11 species of primates including orangutans. A government official responded to recent reports about the bridge’s construction, saying that it would not begin until the environmental impact assessment has been completed. A controversial bridge appears to be inching toward construction in northern Malaysian Borneo. For more than a year, scientists and conservationists have argued that the 350-meter (1,148-foot) Sukau bridge crossing the Kinabatangan River in the state of Sabah wouldn’t be the economic boost for local communities that its proponents say it would be. They’ve also insisted that that the bridge, as well as the paving of a connected gravel road, would irreparably tear apart important habitatfor endangered elephants, primates and birds that have sought refuge in the Lower Kinabatangan Wildlife Sanctuary. “[F]or the past 12 months, we have clearly demonstrated with scientific facts and data that the bridge and the road would have a direct impact on wildlife populations, and especially elephants, orangutans and proboscis monkeys,” said Benoit Goossens, the director of the Danau Girang Field Centre in Sabah, in a statement. Recent scientific research has documented the impacts that roadbuilding can have on tropical forests, from changing the way water flows through the ecosystem to opening once-remote areas to further – and often unintended – development and exploitation. The roots of the project lie in a 2008 plan for the Sabah Development Corridor, designed to jumpstart the state’s economy. The state government of Sabah is in charge of managing the Sukau bridge construction, and funding comes from the federal government of Malaysia. In mid-January, crews cleared forest for machinery storage and an office for the construction contractor, according to the statement from the Danau Girang Field Centre. 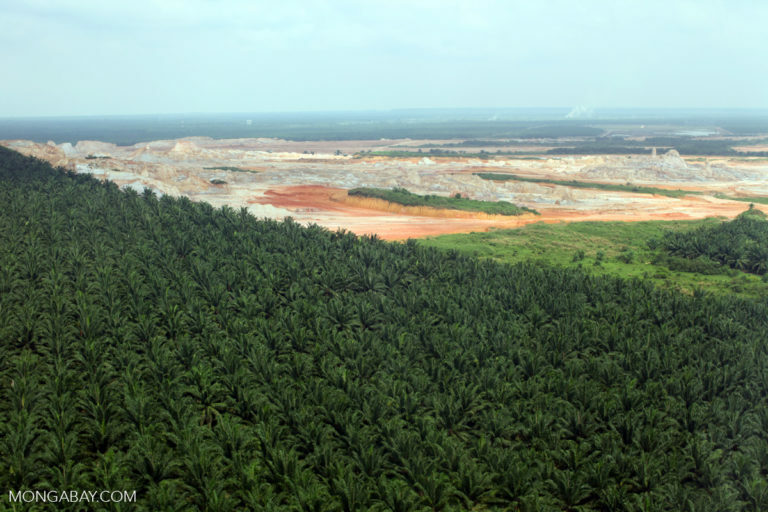 A source familiar with the area told Mongabay that an environmental impact assessment began in May 2016 and is still underway, but that public discussions about its findings are unlikely to occur because they are not required by Malaysian law. Saddi also said he was surprised to hear about the forest clearing, but that it did not signal that the work on the bridge and road paving had started. 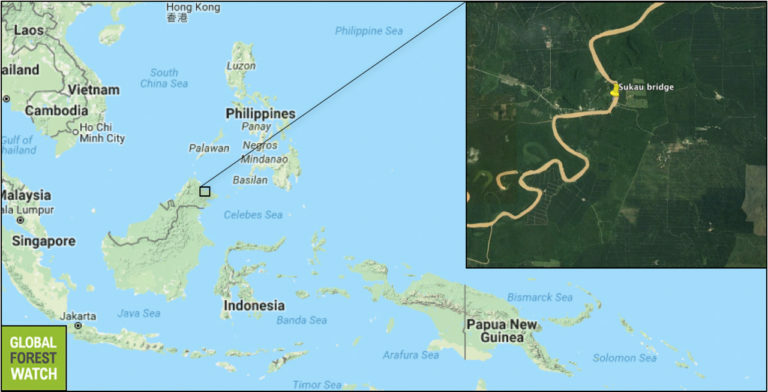 Ostensibly, the bridge, slated to connect Sukau on the west bank of the Kinabatangan River to a gravel road in Kalan Morisem, would provide a route for community members from the villages south of the Kinabatangan River to get to the town of Sandakan. It would also improve access for the numerous oil palm plantations in the region. Crews would pave the gravel road, which was previously built by an oil palm company and winds through oil palm plantations and the wildlife sanctuary. Currently, the Morisem Ferry runs between the two points. John Payne, executive director of the Borneo Rhino Alliance, told Mongabay in 2016 that he questioned why it was being built. “My own view is that there’s no need for the bridge or this road,” Payne said, adding that the region’s oil palm companies were doing fine without it. Goossen’s argument is that the money would be better spent elsewhere. “It would be wiser to upgrade existing roads than build a new one that will primarily benefit plantations,” he said in the statement. Sabah remains a haven for many species of threatened and endangered wildlife, and the Lower Kinabatangan Wildlife Sanctuary is a cornerstone in protecting that biodiversity. Mittermeier visited Sabah in November 2015 for the first time since 1979. 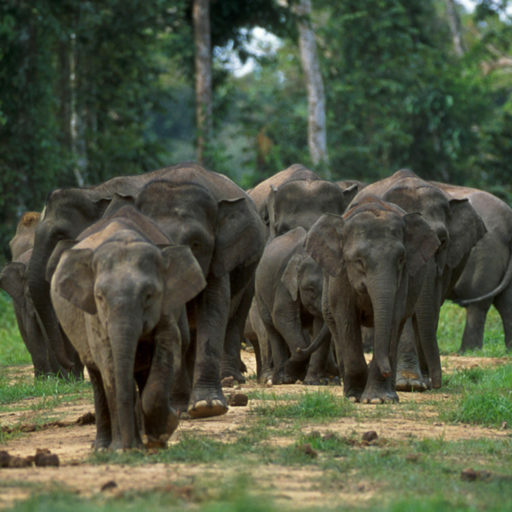 Payne said that he figured the sanctuary also protects the highest concentrations of elephants in Malaysia and added the paved road could spell disaster for conflict between elephants and people. “Sometimes, you have 200 elephants crossing the road, and people are just not used to it,” Payne said. Goossens predicted that more elephants would attack people, and the number of elephants killed would increase as well. 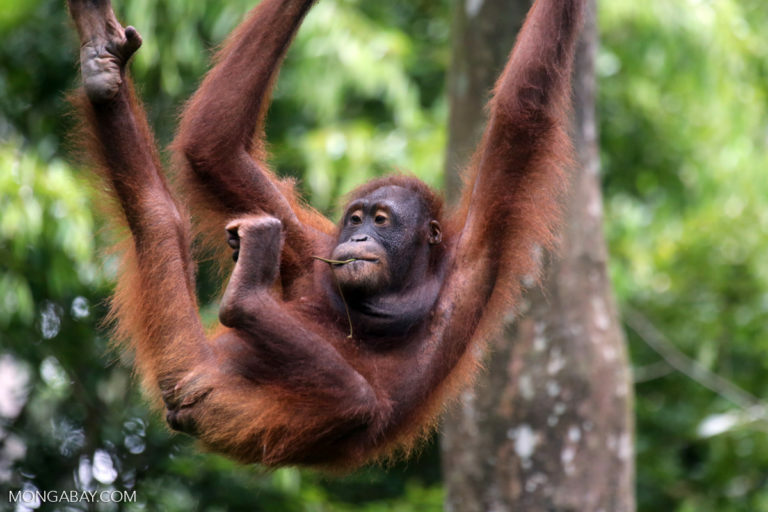 Right now, the combination of relatively easy access, low costs and spectacular wildlife viewing make the Kinabatangan region a prime ecotourism destination, Mittermeier said in his commentary. Musa also cited concerns about fragmenting the area’s forest. The foundation is working with Nestle as part of Project RiLeaf to build up the buffer zone along the Lower Kinabatangan by reforesting 2,400 hectares (9.27 square miles). Goossens view is that the drawbacks far outweigh any benefits: “To me, [the] Sukau bridge will become a bridge to extinction, to both wildlife…and people.